So, where did the idea come from to drink 365 beers in 365 days? I blame Simon Peel (friend and colleague at Ludger) for putting the idea in my head. 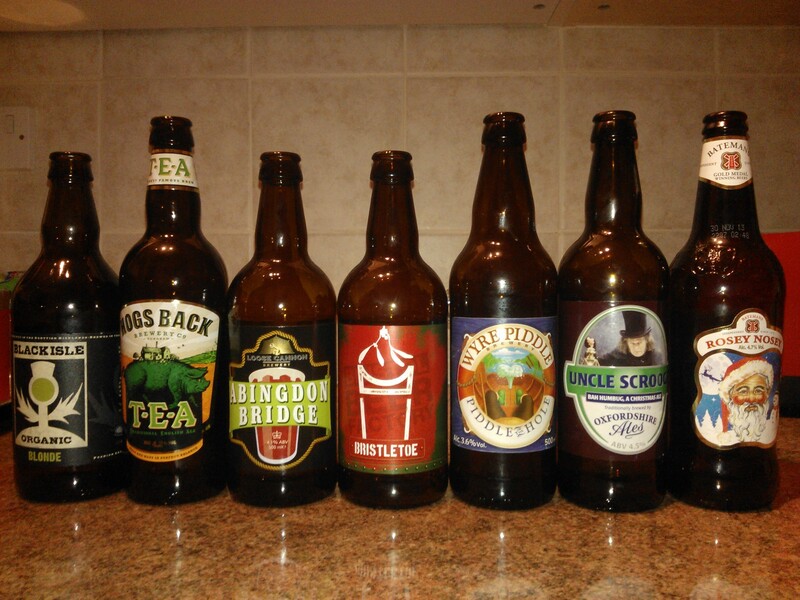 After drinking a few bottles of Real Ale at the beginning of the year, I took a photo of the bottles (see above) and posted it on Facebook. A few friends made comments, Juliet was even kind enough to recommend beerbods.co.uk as a source of real ales (more later on this), and Simon wrote ‘you should try the 365 beer challenge. looks like you’re already up to 7’. After this throwaway remark, I examined my beer consumption since the 1st January this year and discovered that I had drunk 17 different beers already. From this I came to the conclusion that another 348 beers over the rest of the year should be easy. Crazy or what?!? So, that is it really. Despite my girlfriend telling me that I will slowly become an alcoholic (thanks Conchi), I have decided to try drinking 365 different beers in 2013, from 1st January to 31st December. A quick search on the internet shows that many people have tried this feat before and achieved it, people from faraway places such as the USA and Australia. These people have written blogs about the journey they have taken to get from 1 beer all the way up to 365 beers in 1 year, 365 days. So I have also decided to do the same, to share my journey and how I am progressing throughout the year. I won’t be posting every time I have a different beer, but will update the beer list and make a post and add photos every now and again. Wish me luck.